When you just got married and your name happens to be Amy Schumer, where do you honeymoon? In Italy, of course. Schumer, who married chef Chris Fischer, took a trip to eat delicious pasta and drink all the wine, and we’re BRIMMING with envy. The marriage news is admittedly all still incredibly intriguing to us since we didn’t know much about Schumer’s relationship with Fischer prior to their surprise wedding. In fact, she had just posted a photo on social media that confirmed their relationship days before admitting that yes, the two had tied the knot. Schumer talked about her honeymoon during an appearance on The Late Show With Stephen Colbert. She revealed that the trip was 10 days long, and it was more or less a food tour where in which she followed him around to some of the best locations for fresh food. "He's a chef, so he was cooking in Sonoma at Scribe Vineyards. So, I followed him there. Then, he was cooking at a festival in Milan, and I heard that they invented pasta and wine. So, I've just been kind of following him around getting drunk," Schumer said. Best honeymoon ever? Um, yes. 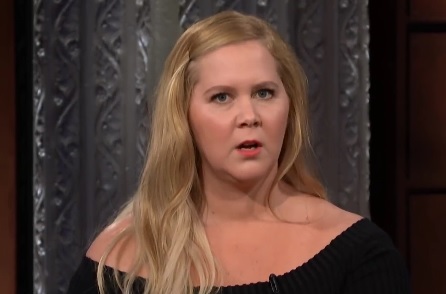 Schumer also noted that she just doesn’t understand people who don’t do carbs, going so far as to clench her heart and look directly in the camera in horror at the mere thought of it. LOL. "You know actresses say ‘I love cheeseburgers.' I'm what you look like if you have pasta and wine," Schumer noted (with Colbert noting that she looks beautiful). Amy Schumer’s 10-day vacation is officially honeymoon goals, and we high-key want to book the next flight to Italy.